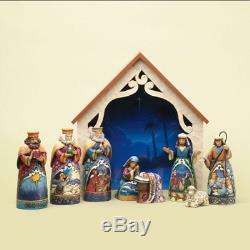 Jim Shore Heartwood Creek Away In A Manger Mini Christmas Nativity Set of 9. Part of the Heartwood Creek collection by Jim Shore. Made from stone resin and medium density fiberboard. Stable is approximately 9.75 inches tall (25cm), while the tallest figure is approximately 4.75 inches tall (12cm). Includes original Enesco box and packaging. Inspired by folk art traditions handed down through the years, this handcrafted Nativity portrays the beauty and wonder of the first Christmas. Thank your for visiting our listing. DecorationWarehouse and Home and Holiday Shops appreciates your business! The item "Jim Shore Heartwood Creek Away In A Manger Mini Christmas Nativity Set of 9" is in sale since Thursday, December 6, 2018. This item is in the category "Collectibles\Decorative Collectibles\Decorative Collectible Brands\Enesco\Jim Shore". The seller is "decorationwarehouse" and is located in Tempe, AZ.